So….we are in full sale mode. 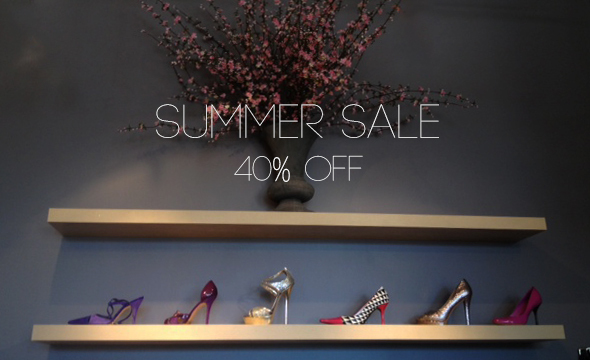 40% off apparel and shoes, the prices are wonderful. I look through the racks and think about some of the great pieces, who wouldn’t want an Ungaro pink plaid jacket to put with a pair of jeans? Maybe a Missoni sweater that looks great with the grey trousers you needed last season? The thing I love about sale is the opportunity to try. Maybe everyday your life doesn’t seem like you should have a leopard print silk skirt. I mean, where are you going? What would it go with? How many times can you wear it? Valid questions, but they all have great answers, but when on sale the only answer should be YES! The prices in the store are already extraordinary and less another 40… there will never be a better time to try. Buy something outside your comfort zone. If you have been wanting to spice up your nightlife, we have a micro short Versace dress. I can promise that a pair of glittery heels will work in your wardrobe if you give them a chance. My point here, dear reader, is that while shopping is fun, buying is even more fun. When a man buys a tuxedo, he thinks “I will wear it to weddings and that is about it” but once it hangs in his closet, opportunity knocks. Someone has last minute tickets to a gala and calls him because they know he can be ready at a moments notice. Black tie optional becomes black tie of course, because it is hanging there. Why don’t more women do that? You should put that one go to dress in your closet for the occasion that you don’t know yet. Maybe it is time to pick up that incredible Bill Blass bubble hem ball dress. All of these ideas are great reasons to come into the store, but the best reason is because we want you to look great, and we won’t steer you wrong, at regular price or on sale, in or outside your comfort zone….and because we’re fun. Oh, and I want to say thank you to my beloved Elaine Stritch. Thanks for all the laughs!